What a joy it remains to learn of artists of a “certain age” having one person shows in New York. I love that in Maturity they can continue to serve as a muse for us all. Today I highlight Nancy Grossman (a long time fave of mine) and photographer, Mark Cohen (who I embarrassingly admit) is new to me. Nancy Grossman (b.1940), For David Smith, 1965. Mixed media assemblage on canvas mounted on plywood, 85 x 85 x 6 3/4 inches, with artist’s frame, signed and dated. Photo: Courtesy of Michael Rosenfeld Gallery LLC, New York, NY. Mark Cohen, a Philadelphia resident, born in Wilkes Barre, has a solo show up at the Danziger Gallery. The image accompanying the information about Mr. Cohen and his unique manner of creating his photographs is, in itself, arresting. How wonderful it would be to be in NY and view is photographs! Mark Cohen, Youth Crouching. 1974. Gelatin silver print. Photo: Courtesy of Mark Cohen and Danziger Gallery. That these artists work remains to be considered important says, I believe, a lot for the recognition available to all who continue to utilize their creativity and reap the respect they and their oeuvre deserve. NEW YORK, NY.- Michael Rosenfeld Gallery presents Nancy Grossman: The Edge of Always, Constructions from the 1960s, an exhibition of nearly forty assemblages and drawings from the 1960s, including her monumental work For David Smith (1965), created from saddles and harnesses the sculptor had given Grossman shortly before his untimely death. The gallery has been representing Grossman exclusively since 1997, and this is the fourth exhibition dedicated entirely to her work. 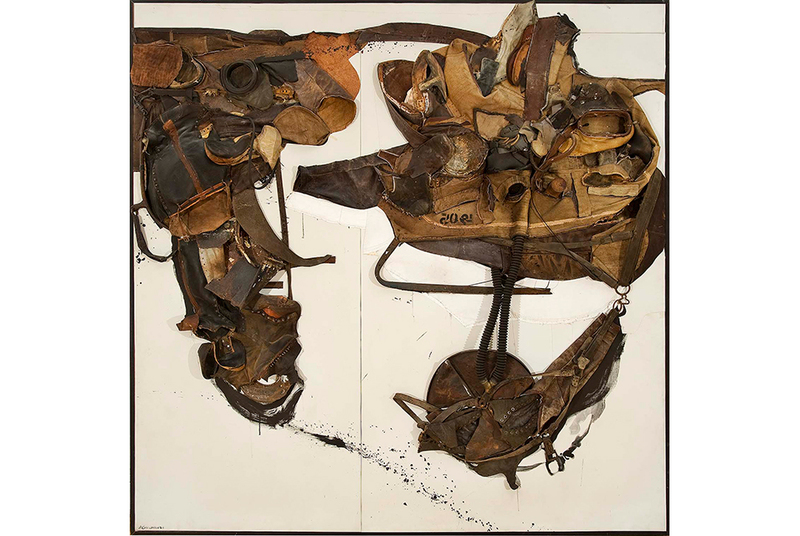 Nancy Grossman: The Edge of Always, Constructions from the 1960s, an exhibition of nearly forty assemblages and drawings from the 1960s, including her monumental work For David Smith (1965), created from saddles and harnesses the sculptor had given Grossman shortly before his untimely death. The gallery has been representing Grossman exclusively since 1997, and this is the fourth exhibition dedicated entirely to her work.